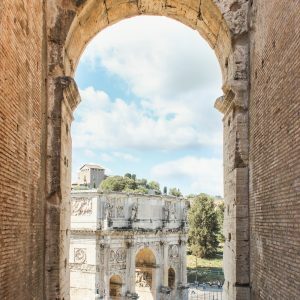 On a sweltering summer day, I boarded a train bound for Rome with no particular itinerary in mind. I’ve been several times in the past and I’ve seen most of the main attractions. 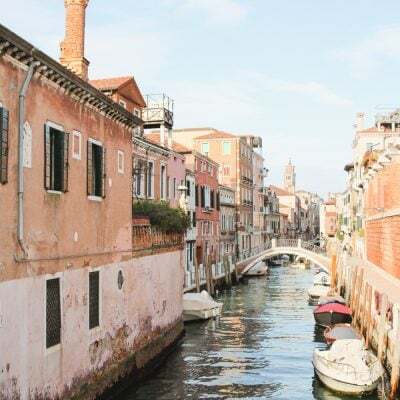 I confess, this trip was mainly motivated by gelato. In order to not make myself physically ill, I sadly had to limit my selection to two gusti per gelateria. This was a solo mission after all and I didn’t have any back up. I always have the intention of getting a refreshing flavor combo like fragola and coconut. However, the creamy hazelnut ones with chocolaty swirls have a way of hypnotizing me and making me forget such well made plans. At least I have an even baseline to make a fair assessment… something about low standard deviation? To be clear, high-quality gelato is something entirely different than a McDonald’s frosty cone and it requires different tastes. 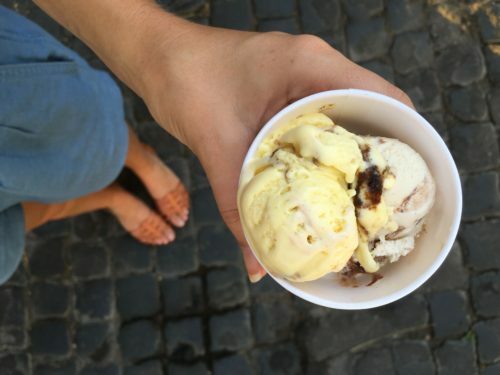 The difference between gelato shops in Rome is similar to the difference between Dryer’s and a homemade, slow churned batch of ice cream. It doesn’t necessarily mean Dryer’s is crap. I love me some low-fat coffee flavored Dryer’s straight from the carton while sitting on the counter in my kitchen. There’s a time and place for that. Last Christmas in Prague, my husband ordered the most deluxe duck burger for dinner at a posh restaurant on the river. It even had truffle butter on it. This meal fit for burger gods was entirely too bougie for him. He has simple tastes when it comes to classics and probably would have preferred a burger from In-n-Out. In-n-Out isn’t trying to be fancy. Like the way Kraft Blue Box mac and cheese is not trying to be Martha Stewart’s crusted macaroni and cheese with aged white cheddar. The two are entirely different genres of food. What’s the point of this rambling? I simply want to establish that even a higher quality gelato might not be your jam… And that’s perfectly ok.
Case and point, Fatamorgana. This is quality gelato made with the freshest ingredients. However, the consistency wasn’t as smooth as other gelato I’ve had. I attribute this to their use of natural ingredients and you can really tell this isn’t an average gelato shop. 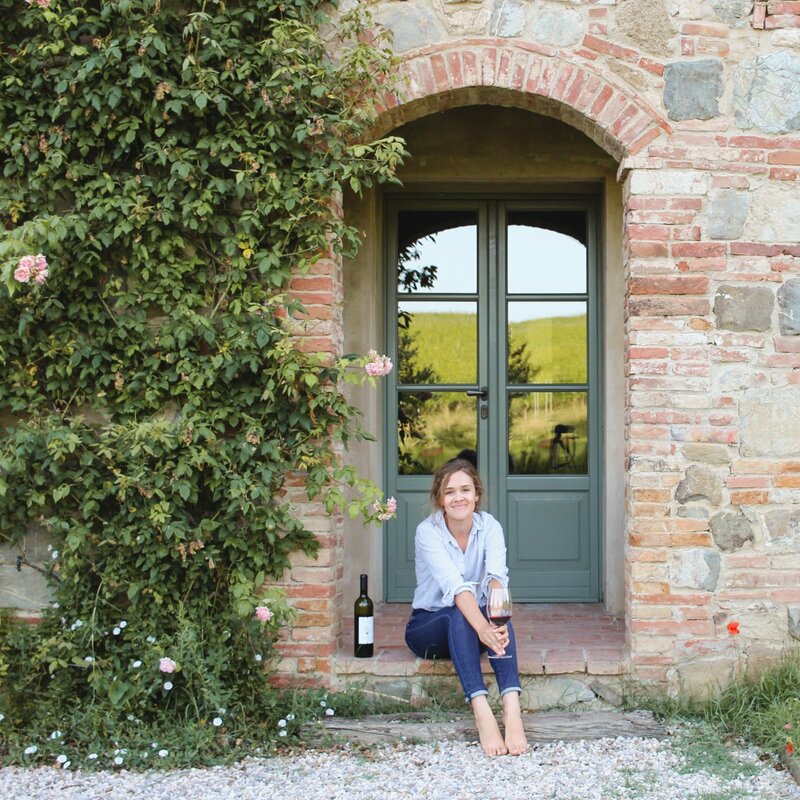 They serve all the classic flavors as well as ones like avocado, lime and white wine. I had the prince’s kiss (chocolaty hazelnut) and tiramisu. The tiramisu was rich and custardy, but ever so slightly gritty. People complain about the portions, but this isn’t an episode of Diners, Drive-Ins and Dives. It’s a labor-intensive, designer-flavored gelato. It’s fresh and not made with thickeners or additives. I also appreciate their effort to clearly state allergens on each flavor’s label. 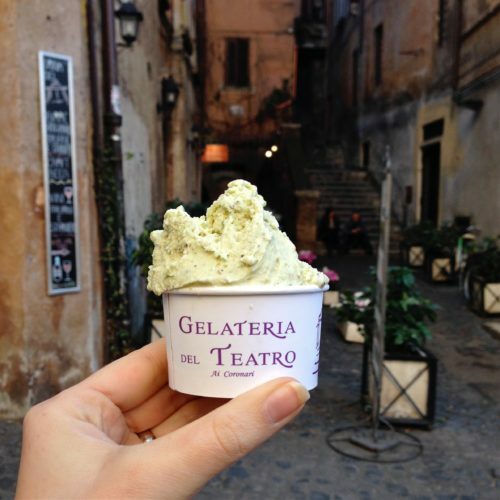 Gelateria del Teatro is in the same upper echelon of high-quality, truly homemade gelato. They have artisan flavors and a few old classics. You’re not going to find their gelato piled high in the display window with nuts, chocolate swirls etc…. and this a good thing. You will see their fresh ingredients though and you can even watch the chefs in action through the side window. Maybe it’s the DQ dip lover in me, but I absolutely love how Frigidarium dips the cone/cup in chocolate. I come here just about every time I visit Rome. Above photo was taken about 7 seconds before I DROPPED IT! That beloved chocolate shell cracked helplessly to the ground. The gelato portion was protected and salvageable. I’m slightly ashamed to admit I picked up the cup, scraped off the top portion that had touched the cobblestone, and finished the rest with desperation as if I’d survived a famine. 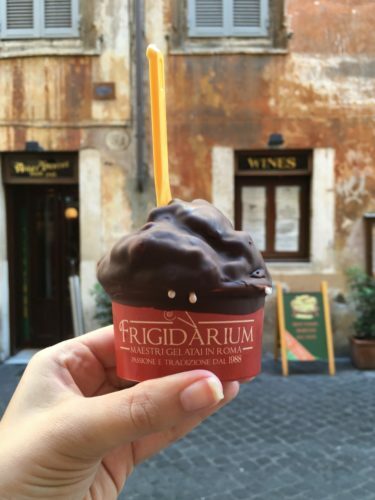 Frigidarium is that good. Giolitti’s has that more vintage, sit down café feeling. I could picture a loud Italian family crowding the counter and sharing dessert here after church (in the 1930s or last Sunday, all the same). I ordered white chocolate and nocciola. Splurge and get the panna on top. I mentioned the corporate chain Venchi after I first had their creamino on a self guided food tour in Florence. 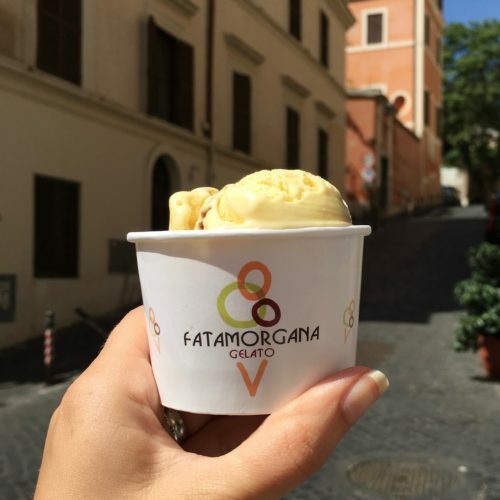 The gelato might not be made onsite by the owners with lemons they hand-picked from their backyard, but that’s not reason enough to overlook this place. Their salted caramel is simply amazing. 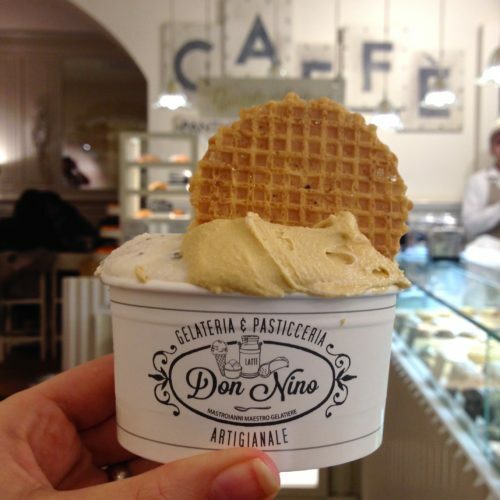 Don Nino modestly stores their gelato in metal tins behind the counter. Where’s the fun in that? I want to “oooh and ahhh” over a glass display case with the 368 other tourists that came to this gelateria today. 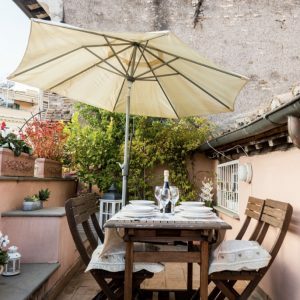 What Don Nino lacks in the display case department, they make up for in delicious flavors and charming décor. 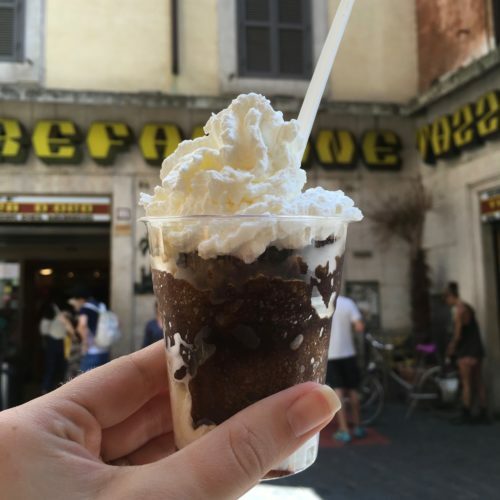 Although coffee granita isn’t technically “gelato,” I couldn’t NOT share this gem with you. Don’t let the cheap yellow lettering and dingy corner near the Pantheon fool you. La Casa Del Caffè Tazza D’oro serves the perfect icy treat on a sweltering day. 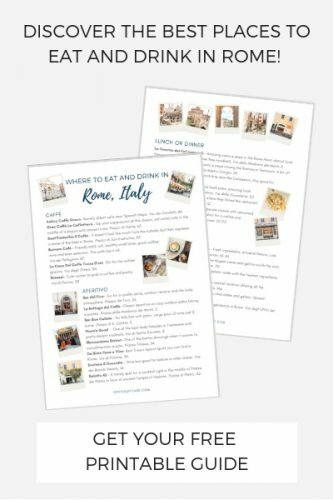 It’s hard to pick a favorite with so many options in Rome. Luckily, the going rate is €2-€2.50 for a small so you don’t have to limit yourself on these affordable treats. 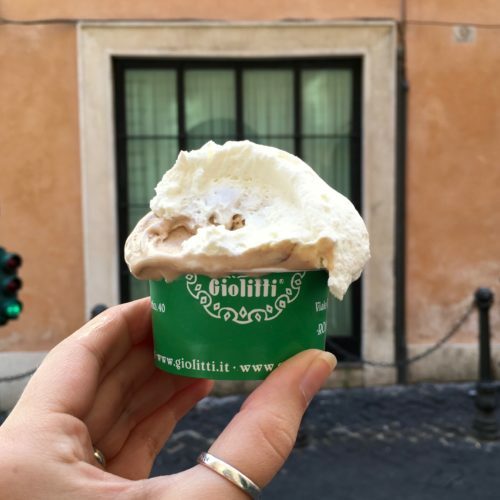 These gelaterias are all centrally located so you just might happen to stumble across famous sites along the way. Yumm! 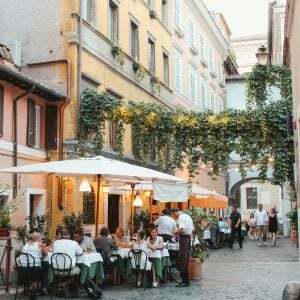 I bet Gelato in Rome tastes the best ever! This looks amazing! 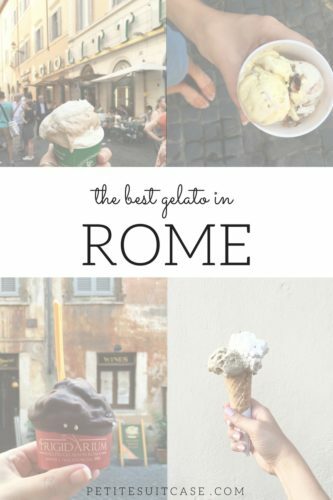 I would totally go to Rome just for the gelato! Right?! Some trips are just worth taking!! I would have also salvaged what was left of my precious gelato after it hit the cobblestones! Haha!! It was a low point admittedly, but I don’t regret it. 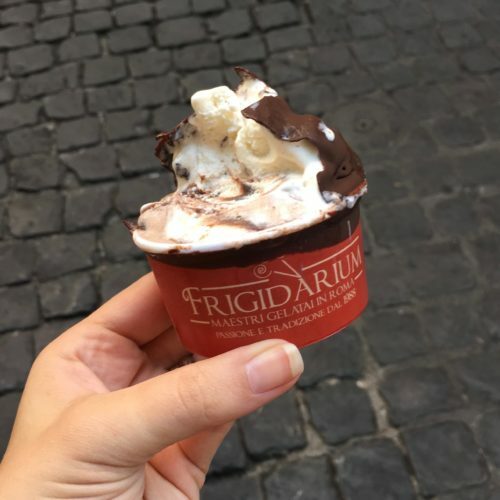 Frigidarium is that good!